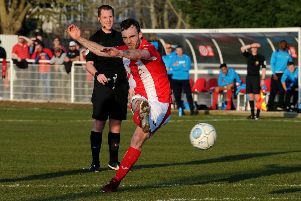 A stoppage-time equaliser from Curtis McDonald saw Brackley Town fight back from two goals down to earn a replay against Newport County in the first round of the Emirates FA Cup. The Sky Bet League Two side had established a 2-0 halftime lead at St James Park through Lennell John-Lewis and Scot Bennett before Saints captain Luke Graham bundled the ball home early in the second half to give the home side a way back into the game. And four minutes into added time McDonald’s header flew past Newport keeper Joe Day to complete the comeback and set up a replay back at Rodney Parade. Saints did not let the occasion get to them from kick off and startly brightly, Glenn Walker feeding James Akintunde on the left but his goalbound shot was blocked. Newport had the first real chance of the game in the eighth minute when Zak Ansah was fed through by Tommy O’Sullivan but his shot was well saved by Saints keeper Sam Hornby. And they were to open the scoring in the 14th minute when Pablo Mills was ajudged to have fouled John-Lewis in the box, with the striker dusting himself off to fire the enusing penalty past Hornby. The Exiles were enjoying plenty of possession as the half wore on, but to the home side’s credit Joe Clarke and Richard Batchelor were working hard in the middle of midfield to stop any attacks. The visitors were to make it 2-0 just before half time though when centre back Bennett made a 60-yard burst into the box and although knocked to the floor by a challenge, he was given too much time to get back up and pick his spot, firing the ball past Hornby into the far corner. Saints needed a goal early in the second half to get them back into the contest and they got just that in the 58th minute. A corner from the right by Walker saw the ball fly towards the visitor’s goal and although Jazzi Barnum-Bobb cleared the ball off the line he could only divert the ball back to Graham who bundled the ball back into the goal. And as Newport tried to wind down the clock as 90 minutes approached, one final attack from the home side saw substutitute Tom Winters deliver an inch-perfect cross for McDonald who sent the Brackley crowd into wild celebrations.